Drilling fluids (or drilling muds) have several functions, including carrying bore cuttings to the surface, cooling and lubricating the drill “string” and controlling subsurface pressures. A simple water based mud for horizontal drilling and some vertical operations consists of clay (bentonite) dispersed into water. In deep wells where the potential pressure of gas/oil dictates a heavier product, inert solids such as barite or hematite are added to weight the bentonite suspension. Muds based on a water/oil emulsion (known as “inverts”) are used for drilling deeper wells as they have better lubricating properties and are more temperature stable than water based muds. Traditionally diesel was used for inverts, however environmental concerns are leading to the use of low toxicity mineral oils, synthetics and esters. Xanthan gum is increasingly used as a rheology modifier, due to the high viscosity that can be obtained with small percentages of gum. Another advantage of xanthan gum is the increased stability it provides with muds based on water or brine. Waste management practices such as re-injection of fluid into redundant wells or transport to shore for remediation are increasing. Mixing equipment must be capable of rapidly incorporating and dispersing powders into the water. The bentonite particles must be reduced to their finest constituent parts to expose the maximum surface area to the surrounding liquid and activate the gelling effect. A degree of shear is required to obtain functionality. 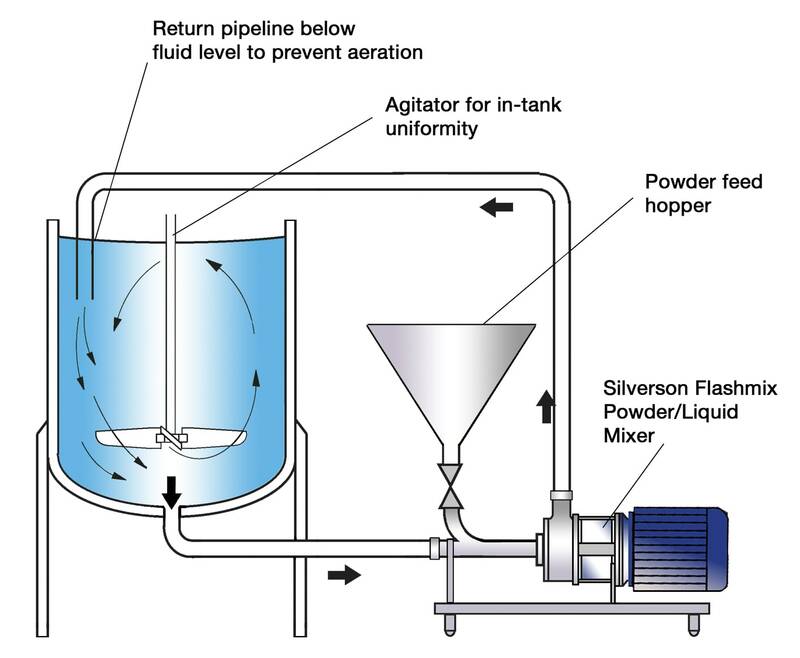 If the product is based on a water/oil emulsion, the mixer must be capable of sufficiently reducing droplet size to produce a stable emulsion. On addition to the water, the particles tend to agglomerate. The washing action of conventional mixers cannot break these down effectively. 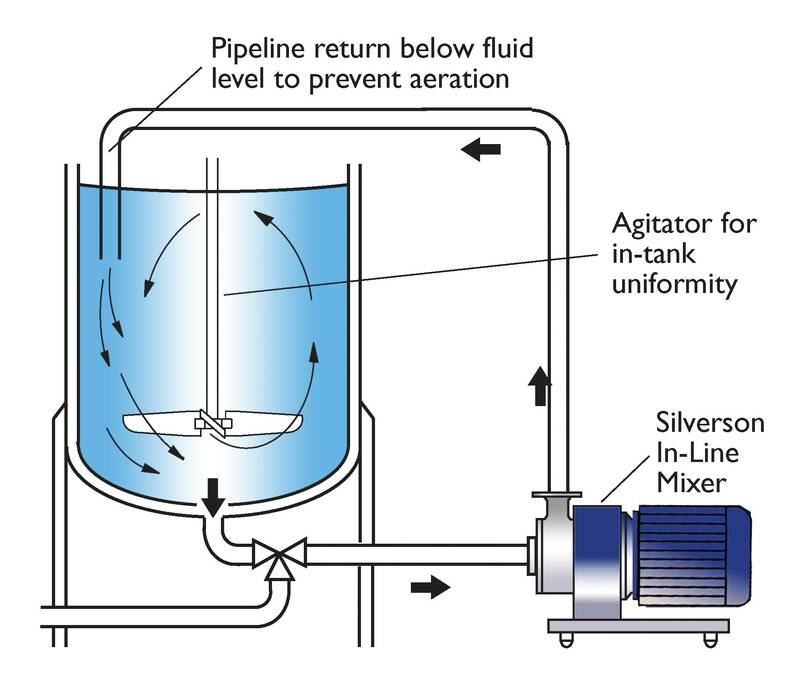 Conventional agitators do not produce sufficient shear to reduce particle size and activate the gelling effect. To overcome this, extra mix tanks may be required to allow the bentonite to pre-hydrate. Generally this process requires a minimum of 4 hours. A water/oil emulsion (where used) can separate out if not properly mixed and stabilised. The high speed rotation of the rotor creates a powerful suction which draws the water and bentonite into the workhead where they are subjected to intense high shear. The materials are subjected to a milling action in the gap between the rotor and stator, breaking down agglomerates and ensuring intimate contact between the liquid and solid particles. The product is forced out through the stator as fresh material is drawn into the workhead. The combination of deagglomeration and vigorous mixing produces a lump-free dispersion and accelerates the hydration process. Easily retrofitted to existing plant. The intense shearing action of the rotor/stator workhead breaks down even hard agglomerates. Finely reduced globule size ensures a stable oil/water emulsion is obtained. The In-Line mixer concentrates its efforts on the relatively small volume within the workhead rather than the entire batch, a more energy efficient process.